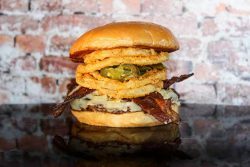 As the temperatures fall here in Birmingham, there are only a few things that can do the trick to keep you warm, and burgers are most a solution. You might be one of the best on the grill in your neighborhood, but sometimes it’s just worth it to throw in the towel and enjoy the work of someone else for once. We’re talking’ burgers. We’re talkin’ some of the best burgers in Birmingham. 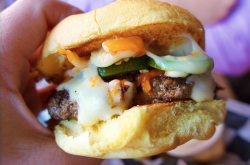 From small and cheap to “fall off the patty” huge, give these burgers a try and we promise you won’t be disappointed. Follow along for some of the most popular burgers in Birmingham. 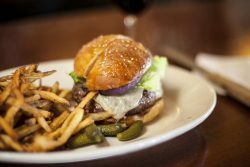 Found in the heart of Lakeview, Jack Brown’s provides one of the most simple, yet creative burgers you can find. Whether you’re in the mood for some spice, a bite of the south, or some barbecue, Jack Brown’s won’t let you down. With their late hours of operation, it might be true that the burgers get better the later the night. Check out The House App daily for the special burger of the day! 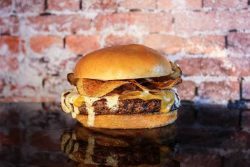 Coming straight from Miller Farms in Delta, AL, this taste of heaven is the definition of “grilled to perfection.” Impeccably combining caramelized onions and a parmesan crisp, FoodBar prepares a delectable burger that will never leave you hungry. This homey joint for local Southern and Cajun dishes is a top location to receive that twist you’re craving. We promise you won’t leave hungry, but we can guarantee it if you order the American Animal Burger, topped with French fries, bacon, a fried egg, American cheese, and their special Animal sauce. 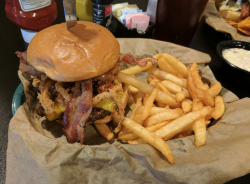 Like a true Southern eatery, Midtown provides the Soco Loco Burger, topped with Soco BBQ sauce, cheddar cheese, crispy onion straws and bacon, as seen below. The Hamburger Fonfon is commonly referred to as one of the best burgers in the Southeast without fail. 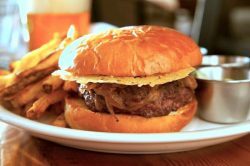 Found in the center of Five Points, this local French bistro provides an upscale and aesthetically pleasing burger that will satisfy each tastebud. Deep in the heart of Texas brings you a hearty burger the size of Texas. In the mood for something a little different? Twisted Root has multiple options for burger meat, including wild game and bison burgers. The name says it all, “Enough said” (pictured on top) tops potato chips and peppercorn ranch to give you the perfect combination. If you’re feeling a little Texan, try the Western Burger (pictured on bottom), with bacon, onion strings, and jalapeños. Try a signature shake if you’re feeling bold enough. Located in the heart of Mountain Brook Village, this whiskey bar specializes in two items: Burgers and Whiskey. How could it get any better that this combination? Adding Truffle & Parmesan Fries to the equation. 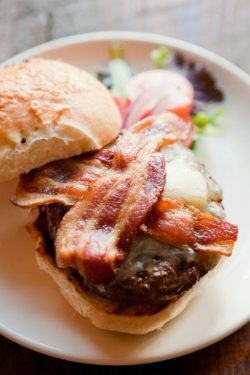 No need to make it any more complicated than it should be already, go ahead and try the Dram Burger, with Angus beef, Gatton Farms (KY) country bacon, and Kenny’s Farmhouse (KY) aged gouda.